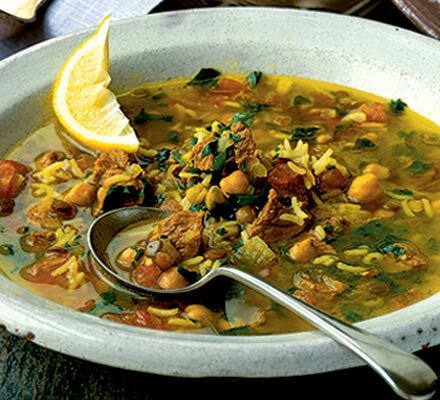 Harira: Moroccan Soup for Supper Club | Izzy have you eaten? We gathered at the Rigby’s home last evening for our monthly supper club. Isabel, I was so happy to be there for many reasons: it has been an out of control month as you well know. I’ve been sick. The house is on the market, and there are random people inspecting all hours of the day ( and sometimes night! ) with their agents. To drop it all and be with good friends and their lovely kids, and eat food we all prepared for each other was such a pleasure and a relief. It is a lovely group of people, and we share a lot of laughs: I will really miss them when we move. The theme this month was Moroccan, and how it works is that the host family cooks the main dish. The rest of us bring the other portions of the meal. Everyone brings a bottle or three. It all adds up to a very satisfying meal. I had been in a mild panic for a few days over what to cook.The Brands were assigned the appetizer. I had initially decided on a semolina ‘roti’ stuffed with spiced onion and olives, but the waiting for the dough to rise and many other steps just made me think that I would run out of time to do it properly. Wise decision. As I kept looking, I was reminded of a delicious Moroccan soup called Harira. Do you know it? I’ve never made it for a family meal, but decided that this would be the occasion to try it out. By the time I’d put it all together, I was quite sure that this was a recipe to send to you: it is hearty and delicious, and a convenient to make all-in-one soup. Once I had assembled the ingredients, it took a nano-moment to make. Most of the time is taken in the slow simmering. I made mine with bite size pieces of chicken ( about 1/4 kg) , but the recipe below is the vegetarian option. The weather continues to fluctuate wildly here. Bright sunny days of quite mild temperatures, followed by flurries of what looked suspiciously like snow on Friday. Claudia and I were incredulous! Today is grey and overcast, with a steady drizzle. I keep bringing the pot plants in from the steps outside, never sure if an unexpected overnight frost might snap them dead. Still, the slopes around Geln Edyth are covered in carpets of bluebells and there is bright yellow forsythia spilling over the castle walls of Casa Loma nearby. At least nature is determined to bring Spring forth; let’s hope it wins soon! The next week will be another crazy one: dad arrives home tomorrow night after three weeks away. On Friday we make the long journey to KL for Easter, and Tasha and Dave’s wedding. You’ll be getting on your flight from Melbourne on Friday too, to meet us there. How very exciting to have another rendezvous with you. After these crazy few weeks, I hope we’ll be able to relax and enjoy the wedding all together. Hen’s night on Wednesday! And Malaysian FOOD! YUMM! Satay! Aunty Roshi’s uppams! Mee Goreng! Nana’s samosas! Uncle Colin’s cutlets! Laksa! I’ll bring my gym shoes! I know you are frantically busy trying to get all your reading and assignments done before you meet us in Malaysia. Good luck, sweet girl; I am thinking of you. Meanwhile, cook some soup to fortify your busy household. I think they’ll like it too. This recipe will feed you all with lots of left overs. Please say hello to Grouse for me. And by the way, we ate our soup before I could take a photograph, so this image is courtesy of the www. It is always good to see what the dish looks like before you make it, don’t you think? Wash lentils and set aside. Heat the olive oil in a stock pot, add the onions, celery, carrots and stir gently till soft, but not brown. Add the ginger and dried spices, and stir further until fragrant. Add the tomatoes, the stock, lentils and chick peas and bring to a gentle boil. Reduce the heat to a simmer and cook for an hour. Add the rice, and adjust seasoning to taste. About thirty minutes later, or when the rice is cooked, stir in the fresh herbs and lemon juice. Serve warm, garnish with lemon slices and enjoy! This entry was posted in GROUP C, Uncategorized and tagged Casa Loma, Chickpeas, Green lentils, Harira by tgb9593. Bookmark the permalink.